Dressed in a white button-up and a blue silk scarf, Sophia Branstrom, San Clemente based illustrator, sits at a table, mesmerized by a water color painting app on her phone. She fit’s the role of freelance artist, but Branstrom assures me that this is all an illusion. She’s referencing the basket full of Valentine’s Day greeting cards on the counter in front of her. It’s 6:15 a.m. in Bear Coast Coffee, and we are surrounded by flowers and the aroma of freshly baked muffins. A Valentine’s Day pop-up shop is being assembled around us. After creating a portrait for Joely Clarke, a freelancing florist, the two teamed up to propose a Valentine’s Day themed pop up shop a Bear Coast. This is only one of Branstrom’s many endeavors as an illustrator. With a commissioned children’s book, a hand painted coffee table, and an art show under her belt, she has more than enough experience. 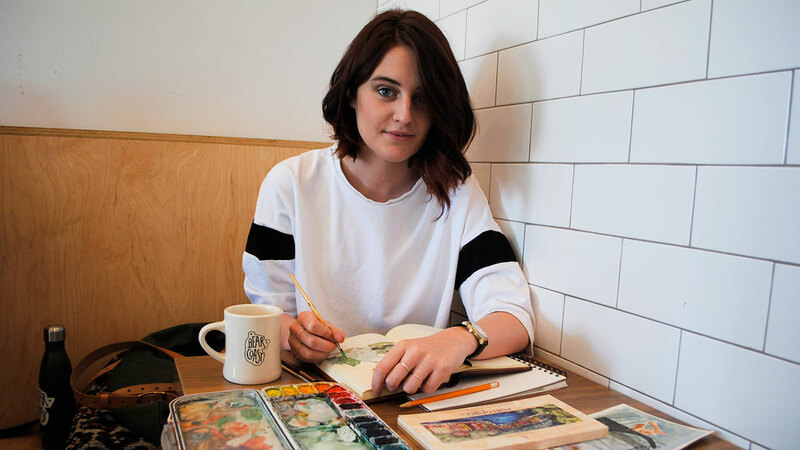 She works with individuals and businesses to create digital and print illustrations, paintings, and designs. She’s currently working on packaging for a fashion line, a project the got by working the pop up at Bear Coast. 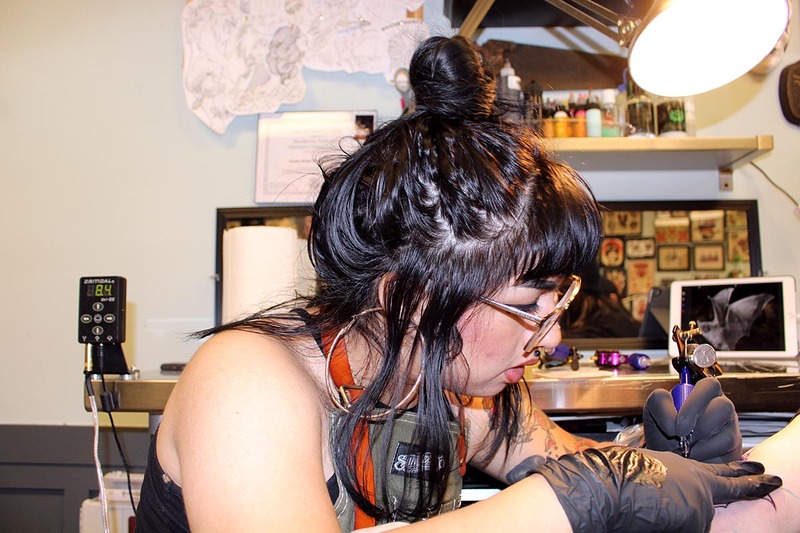 But she is always doing small commissions, like paintings or tattoo designs for friends. “You know how some people see commercials of puppies or kids in Africa and want to help? I’m the same way when I see someone’s flyer or business card,” Branstrom says. She ensures me that she really does care about puppies and children. What she means is she has a passion improving people’s aesthetics and make their businesses better. She is constantly looking at the world around her like one big art piece that she can add to. She has gained support from people like Chuck Pile, director of illustration at the Academy of Art University. Described as a tall, ominous, caricature of a professor, Branstrom took illustration classes taught by him at the Academy. He told her she needs to get her work to New York. But Branstrom doesn’t mind staying local. While her long term goal is to write and draw children’s books, Branstrom has hopes to launch a blog in the near future. She aims to have the blog be a “dorky” perspective on her artistic process and the issues artists face. “When other struggling artists see the super put together artists buying supplies in their cute outfits while they’re in sweats with a half finished project, I want them to not freak out like I do,” Branstrom says. When it comes to the process, Branstrom sees art in everything. Inspired by the shapes and colors she sees in everyday life. She rarely starts off a piece with a sketch. She prefers the “just go for it” mentality, using touch up paint when it’s called for. “I’ll see the color of a bush, and even if I know I’m not going to draw a bush, I’ll be like ‘Oh, I like that.’ and then I go from there,” she says. You can find Branstrom’s work at @sophiafayart on Instagram.